Hub 911 is dedicated to those who serve our communities. Hub911.com Emergency Services Information for First Responders to firefighters, law enforcement officers, public safety, emergency medical technicians (EMS), towing companies, dispatch and all other emergency first responders who would be the first to arrive at the scene of an accident. Submit a Listing for Free! We are Interested in Your Story! Visit Hub911.com's profile on Pinterest. 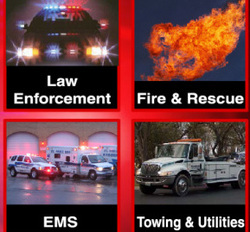 We have got some incredible interviews coming up for EMS, LEO, Fire, Military & Towing... Please let me know if there is someone (even you) who would like to be interviewed for The Hub911.com Thanks!